Apple has recently tweaked a few of the pages / elements in their online store page. 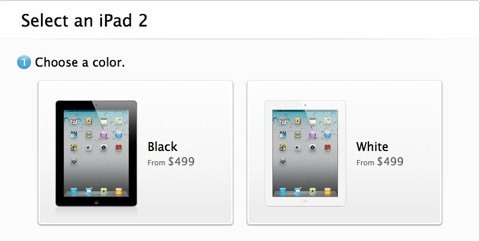 One of the changes is a more user-friendly page for selecting and buying an iPad 2. Instead of just statically showing all the different models and colors and carrier options, the page now asks you to make choices and walk through to get to the model that works best for you. Step 1 on the new page is selecting a black or white model, followed by choosing between 16, 32, and 64GB models and WiFi or WiFi + 3G, and then choosing a carrier. It’s not a massive improvement, but I think it should prove helpful for many first-time iPad buyers.